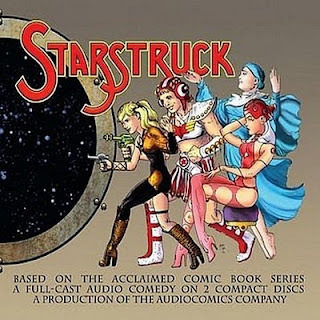 I have some connection with the people behind Audio Comics, which makes its debut as an audio theatre company with STARSTRUCK, but I’m not terribly familiar with the source material. Elaine Lee wrote this based on a stage play dating back to the eighties (written by herself, Susan Norfleet, and Dale Place) which later became a comic series, and I do want to say, if there’s a stage play out there featuring the wild and ribald adventures of four female space rangers, why is this not performed as often as THE SOUND OF MUSIC? This is just what you need to get people going to the theatre again. In any case, STARSTRUCK’s translation to the aural medium is superbly done. It’s a lush and charming sci-fi comedy which has a lot on its plate but somehow manages to avoid a spill into incoherence, which is probably a sign that it’s tighter than it seems. I don’t want to seem too effusive in my praise simply because I do know some of the people involved and have a little bias, but I genuinely enjoyed this and think it’ll be worth a listen for most people. STARSTRUCK follows the crew of the Harpy, four female freedom fighters who are on a mission for the galactic federation when they get come across a curious object on radar. They’ve found another ship, a living ship apparently made from the remains of Galactic Girl Guides. Captain Galatia 9 (Tavia Gilbert) is outraged and decides to investigate, ultimately finding that the ship is owned by none other than her arch-nemesis, space pirate Verloona Ti (Denise Poirier) and her motley crew of pirates and ne’er-do-wells. They’ve got big plans for the multiverse, and it’s up to Galatia, liberated love droid Erotica Ann (Kristina Balbo), Brucilla the Muscle (Jennywren Sanders), and psychic Bronwyn of the Veil (Genevieve Casagrande) to stop whatever it is they’re trying to do, and complete their original mission to keep order on a planet with a kidnapped ruler. With space opera we almost automatically expect a certain grandeur, opulence, and most importantly clutter. An audio play can’t have visual clutter and can’t risk too much audio clutter, so instead it has to throw wild and weird concepts and story twists at us to fully convey a vibrant sci-fi universe. As the summary hopefully indicates, STARSTRUCK has plenty to offer in this department. There are several story threads thrown up by the Harpy’s chance encounter with evil, and while I thought I was a bit lost at times, in the end everything is actually accounted for. It really helps that this this is a traditional trashy space adventure in outre trappings; if you know enough of the conventions and clichés you’ll be able to get the general gist of what’s happening, as we move through discoveries, betrayals, revelations of diabolical plans, and so on and so forth up until the big showdown between space ranger and space pirate. What’s different are the trappings, drawing on various reaches of high and low culture, mixing retro sci-fi and fantasy with wry comedy, bohemian craziness, and a subtle dash of third-wave feminism. Strong production values add to the atmosphere, with various sound effects and atmospheres setting the mood but getting out of the way when they need to. There’s some narration by Simon Vance which helps bridge transitions and give character backstory, but as sparse as it is it doesn’t feel out of place. The cast all do a good job, staying at a high level of energy from start to finish; they keep the momentum up by speaking fast and loud, and allowing themselves to go over the top without becoming shrill. STARSTRUCK is being rolled out in a variety of audio formats and platforms; the link above is to the album on Amazon MP3, but the company site also offers it on CD and it’s being made available through other MP3 sellers as well (iTunes may be in the offing but no concrete word yet). At a little over two hours, it lasts long enough to scratch the space opera lover’s itch, and it should appeal to lovers of the offbeat in all genres. It’s a really strong debut for the company; a slick and professional production of an original and appealing work, that may well find the audience it deserves. This is so peculiar. I remember reading the comic and while I might have forgotten bits of the story the art was just amazing. Kaluta's was at his best doing interior pages instead of just covers. Hey, Evan! Thank you for the kind words. And as of Sunday, November 28, "Starstruck" was indeed released on iTunes!!! Just look under "AudioComics Company" as there are a few Starstruck's on there (most of them Disney Channel-related, I'm sorry to say).